The people of Church Point value living in a safe and attractive community with a strong economic base. The Church Point Comprehensive Long-Range Resiliency Plan aims to ensure that goal. The plan guides future development in the town through Smart Growth planning principals, zoning code updates, flood mitigation, and strategies for economic development and crime prevention. Unlike many communities in south Louisiana, Church Point is fortunate in that it experiences limited flooding during major storm events. Natural hazard mitigation strategies are briefly discussed in the plan, but the emphasis is on economic development and improving quality of life. Due to the small tax-base and limited financial resources of the town, the plan puts emphasis on relatively inexpensive changes that local government can make for improvement in the short-term. Medium and long-term capital improvement projects requiring additional funds are included as well, to inform long-range planning efforts. The Church Point Long-Term Resiliency Plan thoroughly analyses the current condition of the town and outlines a vision for the future. With suggestions for streetscape improvements, new laws, and increased enforcement of current codes, this plan aims to be a springboard for future land use planning and economic development efforts. Courir de Mardi Gras, Church Point, LA. 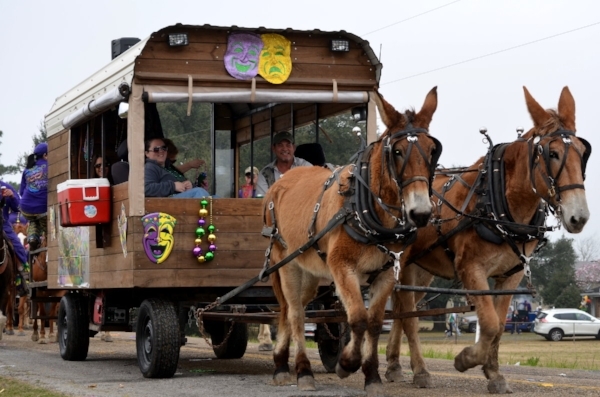 Photo via bayouwoman.com. The primary threats to resiliency in Church Point are economic, social, and political. Disinvestment has plagued the town for decades. An increasing, yet aging, population has strained the resources of the municipal government. Main Street in downtown Church Point is dotted with vacant and under-utilized structures. Crime has become a problem as well. The town has difficulty attracting new businesses and younger residents that would add to the tax base. The Town of Church Point has not been able to overcome the economic downturn that hit in the 1980s. The recent economic crisis has resulted in more vacancies and an increased poverty rate. A comprehensive approach must be taken to bring back investment to Church Point and to improve quality of life for its residents. Through improved land use controls, capital improvements, code enforcement, and maintenance of natural drainage channels, the Church Point Comprehensive Long-Range Resiliency Plan looks to make the town an attractive place to live, work, and visit. With regards to flooding, Church Point is not facing as many challenges as some communities in south Louisiana. Located over 40 miles inland from the Gulf of Mexico, Church Point is not at risk for coastal flooding from storm surges. Major storms do result in property damage from wind and localized flooding. The area around Bayou Plaquemine Brule, which drains the majority of Church Point, has been designated as a 100-year floodplain by FEMA. The bayou has not been maintained and over time, and as a result, the stormwater storage capacity of the bayou has decreased. Consequently, in 2010 FEMA expanded the 100-year floodplain area. If Bayou Plaquemine Brule continues to be neglected, the floodplain may expand and place more properties at risk of flooding. Coordinate at a regional level for improved stormwater drainage. Ensure regular maintenance of channels that drain the town. Decrease damage from severe weather events by means of several options including stormwater management and zoning code enhancements. Because of lack of population growth, new roadway infrastructure is not recommended during the twenty year planning horizon. However, the planning document contains a Sidewalk Improvement Plan, which provides a framework for capital improvements of pedestrian networks across Church Point. The plan also encourages Church Point to encourage infill development to take advantage of existing infrastructure and minimize future maintenance costs. The majority of this planning document focuses on improving quality of life in Church Point. High crime and a weak local economy are major threats to the long-term viability of the town. Applying the “broken window theory” that one building allowed to deteriorate (one “broken window”) will deter investment and attract crime (more “broken windows”), this plan encourages improvements to the physical environment to increase livability. The capital improvement plan lists infrastructure projects and policies that should be implemented over the next 10 years. Enhancements to sidewalks, streetlights, and parks, for example, will improve quality of life for residents and also attract new investment. Investment in the town will strengthen the local economy and provide funds for more civic improvements, leading to a higher quality of life. In turn, additional businesses will be attracted to the area and the cycle continues. A few strategic structural projects and improvements to the civil ordinances of Church Point will set the town on the road to continued prosperity. Strengthening and enforcing the civil and criminal code is a critical step to resiliency outlined in the plan. The Town of Church Point currently lacks the legal tools necessary to combat problems stemming from abandoned and nuisance properties. The current zoning ordinance, based on cumulative districts, is also inadequate for guiding development to reflect the vision of the community. Codes based on cumulative districts commonly lead to incompatible land uses existing in close proximity. Undertake a thorough restructuring of the zoning code, with parcel-based maps, districts based on desired character, and ordinances to improve property aesthetics such as buffering, landscaping, parking and building design. Adopt a Unified Development Code as an alternative strategy to equip the town with more tools to implement their vision. Create a position in town government to oversee planning and code enforcement, to ensure that the updated ordinances are followed and violators are penalized. Increase funding for the police department will also aid in strong code enforcement and increased public safety.